Death penalty in America: How the push to abolish capital punishment has made lethal injection less safe. In the push to abolish the capital punishment, opponents of the death penalty have made it less safe. It’s clear that lethal injection has become more gruesome and violent in recent years at least partly as a result of opposition to the death penalty. On Thursday, Oklahoma’s attorney general agreed to an 180-day stay of execution for Charles Warner, whose lethal injection was delayed last week after the Department of Corrections bungled the execution of another death-row inmate, Clayton Lockett. The Oklahoma debacle has forced us to confront a good many lingering questions about the current capital punishment regime: Should we execute criminals, and if so, which ones? How should we do it and who has the authority to scrutinize the system? In a profound way, Oklahoma’s Gov. Mary Fallin was almost single-handedly responsible for forcing us all to revisit a death penalty system that has been hopelessly flawed and biased for decades. Even if you agree that executing Lockett was the right thing to do (he raped a woman and watched as another victim was buried alive), it doesn’t change that fact that what was done to him was also unconscionable in a civilized society. But as federal and state investigations look into what really went wrong in Oklahoma, here are a few more questions: How is it possible that our capital punishment protocols have become worse in recent years? And who is responsible, really? The death penalty is on its way out. In 1996, three-quarters of Americans surveyed still believed that convicted murderers should be put to death, according to Pew. Today, only about half the American public supports it, and that number is dropping. But that seems to be part of the problem, at least in the short term. In the drive to ensure that nobody is executed in America, death penalty opponents, both in the U.S. and in Europe, have been successful at pushing through some remarkable changes—but these are turning out to be complicated victories. Nothing about the screw-up in Oklahoma last week is a surprise. Yet another expert panel has laid out the issues in a report this week. The 32 states that still have capital punishment all use injection as their primary method of execution. Until recently, most relied on a pretty uniform three-drug protocol. But in 2011, the last American company, Hospira, stopped manufacturing one of the three drugs when it decided to open a plant in Italy, where, as in the rest of the European Union, the death penalty is illegal and viewed widely as barbaric. * A sustained European campaign to stop these drugs from use in executions has led to a massive drug shortage in the U.S. and forced capital punishment states to turn to unregulated compounding pharmacies and other iffy sources for similar or less effective drugs. New drugs and new protocols are being tested out for the first time on living humans in the death chamber. The protocol used last week in Oklahoma had never been tried in that state before, and used only once in Florida. We know how that turned out. Moreover, for ethical reasons the medical profession often won’t allow physicians to participate in the process. In 2010, the American Board of Anesthesiologists decided to revoke the certification of any member who participates in a lethal injection, under the rationale that “We are healers, not executioners.” The American Medical Association has been arguing at least since the 1990s that participating in capital punishment is a violation of the Hippocratic Oath. All this means that we don’t always know who is actually performing which part of any one lethal injection (untrained prison officials? doctors operating surreptitiously? execution specialists?—are there even such things?). Put all this together and it’s clear that the reason lethal injection has become more gruesome and violent in recent years is at least partly a result of opposition to the death penalty. Lethal injection was supposed to be the humane alternative to firing squads and hangings. But as American physicians sideline themselves and European pharmaceutical firms (and American ones with global ties) decline to supply the most known and efficacious lethal injection drugs, corrections officials have been pushed to use inferior methods and substandard providers. In other words—and painful though it is to admit—the real culprit in the death of Clayton Lockett is opposition to the death penalty. In pushing for outright abolition of capital punishment, we have undermined the counterveiling effort to make it as clean and painless as possible. The perfect has become the enemy of the good-enough execution. Before the botched Lockett execution, Oklahoma Attorney General Scott Pruitt argued that the need to hide every aspect of the lethal injection plan was as a direct result of “schemes and intimidation used by defense counsel and other anti-death-penalty groups.” Claims that a wealthy and powerful national lobby of death penalty abolitionists are terrorizing corrections officials are likely exaggerated. 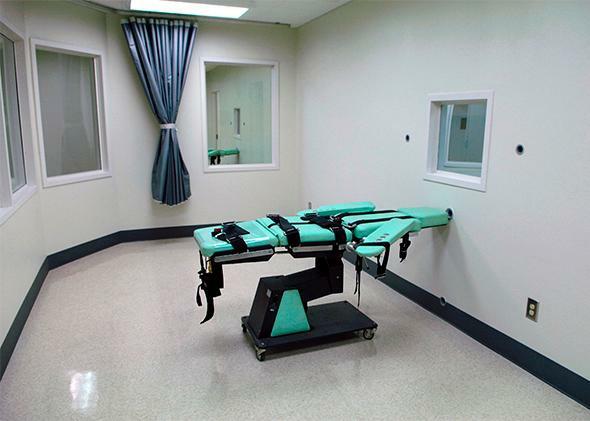 But the fact remains that what was, until pretty recently, a fairly standard national method of lethal injection has been driven underground and into the dark by efforts in both the United States and Europe to end capital punishment altogether. Death penalty opponents are faced with a truly terrible choice: Continue insisting that no capital punishment system will ever be tolerated in the United States of America, or work with those who demand executions in order to create a system that is more humane in the right now.